Unknown. (2008, June 02). CrashZeppelin.jpg. 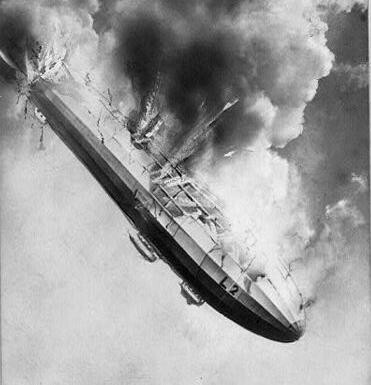 Retrieved June 22, 2012, from Notre Dame OpenCourseWare Web site: http://ocw.nd.edu/physics/nuclear-warfare/images-1/graf-zeppelin. I tried presenting a webinar last night. The above photo pretty well illustrates what happened. No audio. Nobody could hear a thing. I was feeling quite poorly all day yesterday, and hadn't improved any by the time the webinar was scheduled to begin. I went ahead anyway. It wasn't good. In fact, it was down-right ugly. I either clicked or unclicked a button that caused the webinar to not have any audio for the participants. In hind sight, I'm thinking it was just as well you couldn't hear me, because I wasn't sounding so good. Then, when I was finished I shut the whole webinar platform down, and killed the recording. UGH!! For those of you who attempted to attend the webinar, I apologize. I'm sorry I was not at my best. I'm sorry you didn't get to attend a high quality webinar from me that you have come to expect. You all let me know about this. I received quite a few emails. Some were patient and understanding, just wanting to know what happened. Others were indignant and frustrated. I am not Thomas MacEntee. Yes, no doubt about it, Thomas provides first-class webinars that make it all look easy. I love his webinars just as much as you. Unless you are Thomas, it really does take two people to run a successful webinar. One person to moderate, and one person to present. Again, I am not Thomas. I learned last night that I need someone else to moderate the live webinar while I present. I currently do not work for Legacy Family Tree, Ancestry, or any other family history company. LOOKING4ANCESTORS is me, Kathryn Lake Hogan. One person. I do not have the dedicated technical support and resources that those large companies have. I have me; that's it. Up until now, all my webinars have been live and free for those attending. Those free-to-you webinars cost me time and money. Time to research the content, and time to format the presentations. Money to pay for the webinar platform. I cannot possibly meet everyone's schedule. I live in the Eastern time zone. If you think you're tired at 9:00 pm having to listen to a webinar after a long day, then imagine how tired I am presenting the webinar at 9:00 pm, after a long day. So, why do I do webinars? I present webinars because I enjoy providing information to family historians to help them with their research. Changes are planned. Over the next month, I will be recording webinars and making them available to you on demand. They will not be free. They will range in price depending on length and content. All webinars will be under $20 US, and will include a syllabus that you will be able to download immediately. For those people who attempted to attend the Mapping Your Ancestors' Footsteps webinar last night (Thursday, June 22, 2012), I will personally send you an invitation to view the recorded version of this webinar with a coupon. ( I have a list of those who were there.) The coupon will allow you to view the webinar for free. Please give me until July 6th to get this to you. Thank-you to those of you who emailed me and were genuinely concerned about what happened last night. I appreciate your continuing support and understanding.